Elaine Bass (née Makatura) is an American title designer and filmmaker. 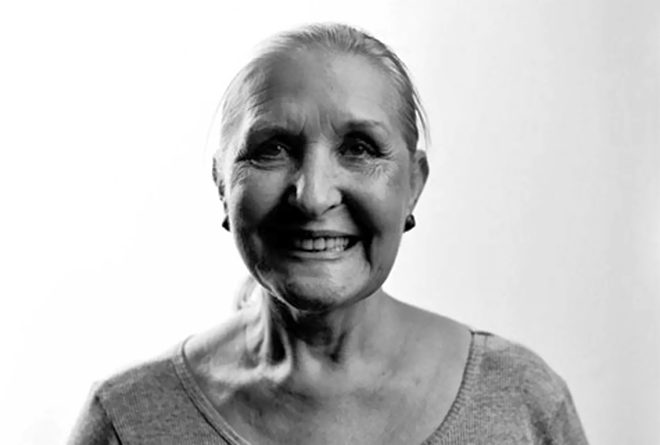 She was the partner and close collaborator of designer and filmmaker Saul Bass for more than 40 years. Born to Hungarian immigrants in New York in 1927, Elaine’s early years were full of drawing and singing. From age twelve to eighteen, she and her sisters sang professionally as the Belmont Sisters. Thereafter, Elaine worked in the ready-to-wear fashion industry in New York until leaving for Los Angeles in 1947, where she got a job in the design department at Capitol Records. 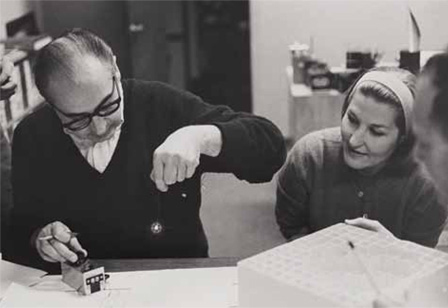 In 1955, Elaine got a job as the assistant to graphic and title designer Saul Bass. In 1960, Elaine directed on her own for the first time with the opening title sequence to Spartacus. Much of Saul Bass’s title design and film work thereafter was made in close collaboration with Elaine. The following year, Saul and Elaine married. In the ’60s, they collaborated on the title sequences to West Side Story (1961), Walk on the Wild Side (1962), Nine Hours to Rama (1963), The Victors (1963), Seconds (1966), and Grand Prix (1966). After the birth of their children, Jennifer in 1964 and Jeffrey in 1967, the Basses concentrated on their family and short films. Their first joint venture into short filmmaking was with promotional films for two pavilions at the 1964 World’s Fair, From Here to There for United Airlines and The Searching Eye for Eastman Kodak. In 1968, they made the short film Why Man Creates, which won an Oscar. “Elaine and I feel we are there to serve the film and to approach the task with a sense of responsibility. We saw a lot of pyrotechnics and fun and games and I suppose we lost interest. At the same time, an increasing number of directors now sought to open their own films in ambitious ways rather than hire someone else to do it. Whatever the reasons, the result was ‘Fade Out.’ We did not worry about it: we had too many other interesting projects to get on with. Equally, because we still loved the process of making titles, we were happy to take it up again when asked. ‘Fade In’…"
Bass was “rediscovered” by James L. Brooks and Martin Scorsese in the late ’80s, who urged the Basses to return to main title design. They created the title sequences for films Broadcast News, Big, Mr. Saturday Night, The War of the Roses, Higher Learning, and for Scorsese, Goodfellas, Cape Fear, The Age of Innocence, and Casino, their last title sequence together. 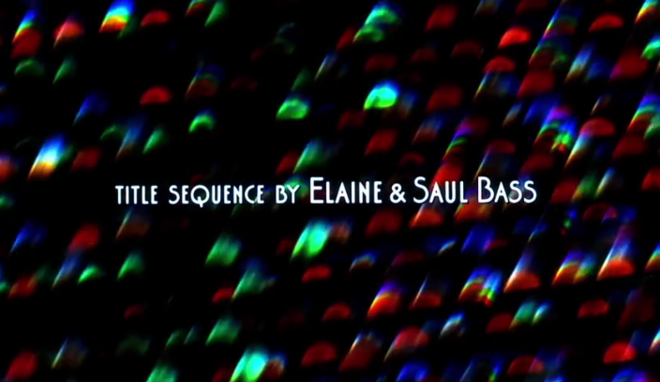 After the death of Saul Bass in 1996, Elaine collaborated with title designer Pablo Ferro to update the opening for the remake of Psycho (1998). In a sense, all modern opening title sequences that introduce the mood or theme of a film are a legacy of the Basses’ work.